Everyone is still reeling from the recession, and cash is tight–not, perhaps, the best time for Microsoft to launch a new version of its ubiquitous Office productivity suite. Nevertheless, with Office 2010, Microsoft continues to refine the dramatic overhaul that it began with the 2007 editions, while adding a few nifty new features with marquee appeal–all at prices much lower than we saw for similar Office 2007 packages. The most immediately visible innovation in the new suite is a set of Web-based applications–online versions of Word, Excel, PowerPoint, and OneNote–slated to appear on Windows Live when the desktop editions ship in June. For businesses that wish to host their own Office Web Apps privately, Microsoft will also offer SharePoint versions of the online suite. But while Office Web Apps enable at least minimal collaboration–and while they shine at maintaining document formatting that competing, third-party Web-based apps tend to mangle–they’re unlikely to bowl over anyone who has enjoyed the rich features in Google Docs, Zoho Office, and various other Web-based productivity tools. In fact, they’re not intended to: Microsoft has clearly stated that it created Office Web Apps as companions to, rather than replacements for, their desktop counterparts. Still, we probably can thank the online competition for the significant declines in Office suite prices: Three years ago, the Standard Edition, containing Word, Excel, PowerPoint, and Outlook, debuted with a suggested retail price of $399; the price for Office 2010 Home and Business, which includes those four apps plus the note-taking program OneNote, now costs as little as $199. OneNote is now present in all editions of Office, and Microsoft has tightened that program’s integration with the other apps to make transferring material to OneNote easier. In general, the shipping version of the suite isn’t much different from the Office 2010 beta we wrote about last year. Some of the new features should impress even jaded Office users; PowerPoint’s Broadcast Slide Show function, which lets you show a presentation remotely to anyone with a Silverlight-enabled browser, heads the list. Improved customization features for the ribbon interface, which premiered in the key Office 2007 programs and is now present suitewide, could mollify some of the ribbon’s many critics: You can now assemble the commands you use most frequently–regardless of where they normally reside–in tabs and groups of your own creation. Overall, the suite’s look is more consistent from one app to another–and more subdued than its predecessor, primarily because Microsoft opted for a palette of mostly grey and white, versus the sky blue of Office 2007. Gone is the big and somewhat un­­gainly Office button that appeared in the upper-left of each window. Instead, clicking on the File tab now brings up a new window (called Backstage view) with a slew of options for creating, saving, sharing, and printing, as well as for accessing recent versions of the current document–or easily opening others via a handy list of recent documents. This window also leads you to menus for application-specific options. In addition, Office 2010 introduces a nice little refinement to the most basic of all content-creation tasks, pasting material you’ve cut or copied. The new Live Preview for paste not only lets you opt to retain the source formatting, merge with destination formatting, or transfer text, but also allows you to see what your choice will look like before you commit to it–much the way the ribbon lets you try out formats by hovering your pointer over them. The suite also now boasts some fairly sophisticated image- and video-editing tools that could, for many users, eliminate the need to process media with third-party applications before using them in Office documents. Responding to the increasing problem of malware that arrives in files downloaded from the Web, the programs now by default open downloaded Office documents in a protected view, with editing disabled until you explicitly authorize it by clicking a button in a highly visible warning that appears at the top of the window. Some other new features work only with other Microsoft applications, such as a presence indicator that allows you to see which of your Windows Live Messenger contacts are online and to initiate conversations from within various suite applications. Office 2010 is the first iteration of the Microsoft suite to arrive in both 32- and 64-bit versions. The 64-bit edition, however, does not have the full functionality of the 32-bit suite: Among other things, third-party Outlook Social Connectors (for displaying updates from popular social networks within Outlook) are not immediately available for x64 (Microsoft says they will arrive eventually), and Outlook x64 does not support synchronization with Windows Mobile devices because 64-bit versions of Windows lack the Windows Mobile Device Center. The 64-bit editions of Excel and Microsoft Project can use x64’s ability to address more memory to run huge spreadsheets or project models, respectively (though strangely the same does not hold true for large Access databases). Unless you bump into limits with the 32-bit version of these applications, however, Microsoft recommends that you stick with the 32-bit edition of Office, even if your computer runs a 64-bit operating system. Overall, Office 2010 shapes up as a pleasing and, in many ways, useful successor to Office 2007. Microsoft isn’t offering upgrade pricing, but the Product Key Card versions aren’t outrageously expensive, and many people will be fine with either the four-app (Word, Excel, PowerPoint, and OneNote) Home and Student edition for as little as $119, or, if Outlook is a must, the $199 Home and Business suite. Especially if you skipped Office 2007, a switch to Office 2010 is worth considering–even in a recession. Apart from the suitewide alterations detailed above, Word 2010’s key changes focus on design tools. First among them are new OpenType typography features that let you apply artistic effects ranging from ligatures to glows to beveled edges, all easily accessible from the Fonts pop-up window. In longer documents with subheads, the navigation pane (easily accessible from the View tab) makes skipping between sections simple. The new Insert Screenshot feature (found under the Insert tab) permits you to add, in­­stantly, an image of any open, nonminimized window on your desktop; without exiting the document, you can even opt to add just a region of an open window, which you can define on the fly. New image-editing tools within Word allow for a wide range of adjustments and effects, including a compression feature to help keep overall file size down. Unfortunately, Word has become such a powerful document-creation tool that its online counterpart is all the more of a letdown. Using the Web app isn’t difficult: The Save & Send screen has a convenient ‘Save to SkyDrive’ option, and I didn’t mind not having all of the rich media tools. But the Web app’s lack of support for Word’s own revision-and-review toolset seems unpardonable, since one of the best reasons for a Web version is to simplify collaboration. While the Web app does support simultaneous editing, the feature is still underwhelming. The eye-popping chart graphics introduced in Office 2007 are certainly a hard act to follow, and aside from the suitewide image-editing, OneNote integration, and paste-preview features, the new Excel doesn’t offer a lot to brag about. As in the beta release, the most eye-catching innovation is the addition of Sparklines, a feature that can create tiny charts in a single cell to illustrate trends in a row of figures. Excel power users who own the 64-bit edition stand to benefit from the ability to manipulate massively larger amounts of data thanks to that version’s increased addressing of memory. Excel jockeys also will want to download the free PowerPivot for Excel 2010 add-on, which lets you gather and analyze huge amounts of data from multiple sources. The ability to save such complex spreadsheets to the Web, open and edit them in the Web version of Excel, and return them to the desktop without encountering formatting issues is probably one of the strongest achievements of Office Web Apps. Anyone who has attempted to do this kind of thing with third-party Web services knows just how difficult it can be. But as with Word, functionality in the Web edition of Excel is severely limited, offering no charting tools whatsoever. On the Web, you can use functions (they appear in a pop-up menu near the cell where the result will go), insert a table or hyperlink, and refresh data from outside sources. But in my tests the performance was painfully slow. Have I mentioned how cool PowerPoint’s Broadcast Slide Show feature is? It bears repeating, as everyone I tried the feature out with was very impressed. Yes, you can run remote presentations, not to mention live demos and more, with services such as WebEx–but if all you want to do is share your slides (presumably in tandem with a conference call), nothing beats the sheer simplicity of being able to do so straight from your desktop. My only quibble with Broadcast Slide Show: As when you use a projector, you can’t see your speaker notes when you’re broadcasting without a second monitor–you can see only what your audience sees. This is something for Microsoft to work on next time. Other PowerPoint improvements in­­clude fairly robust built-in video-editing features that not only let you trim your embedded video but also bundle it up so that it travels with your presentation. You can import video from the Web on the fly, too, and all the neat image-acquisition and editing features available in Word apply here as well. As all previous new versions did, PowerPoint 2010 enlarges the already handsome arsenal of transitions and themes with new eye candy, including a selection of 3D effects. A new animation painter allows you to apply animation you’ve created for objects in one slide to objects in other slides. And a new autosave capability will surely rescue more than one work in progress from oblivion after an unexpected crash. Similar to the other applications, the Web-based version of PowerPoint is embarrassingly skimpy–not just in comparison to its desktop sibling but to online competitors such as Google Presentations and Zoho Show. You can create slides containing only text, still images, and smart art (Google’s app at least lets you insert a video); in addition, you get merely a few image style tools, and no animations or transitions. I found working in the PowerPoint Web app frustratingly slow, too. To the existing panes (folders, messages, reading, and calendar), the default mail view adds a people pane that shows your recent interactions with the sender of whatever message appears in the reading pane. The people pane also is home to the most interesting new feature in the beta, Outlook Social Connector, which lets you view updates from popular social networks for contacts who are members. This function, however, works only with networks that support it with a downloadable add-on (at this writing, only Linked­In and MySpace provide add-ons; Microsoft says that Facebook and, oddly, Windows Live add-ons are due soon). Another concern is that Microsoft does not support Social Connector for the x64 edition of Office. I liked Outlook’s new Quick Steps feature, which is basically an easy way of creating rules and applying them to specific messages (as opposed to filters, which perform actions on a set of rule-defined messages). The app comes with several predefined Quick Steps, but creating a new one took only a few seconds and a couple of clicks. Myriad other tweaks simplify setting up meetings from within e-mail, creating a team calendar, finding a room for a meeting, and other routine tasks. As with the other Office apps, clicking the OneNote button in Outlook’s ribbon sends the item at hand (contact, e-mail message, or the like) to whatever notebook you specify. If Office users don’t all start using OneNote to take notes (typed or, where digital ink is supported, handwritten), to gather and organize thoughts and information from various sources, and to share everything with colleagues, it won’t be for lack of trying on Microsoft’s part. 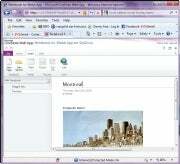 The 2010 version of OneNote, now a component of all Office editions, adds some powerful tools, including an improved search function, the ability to turn handwritten math equations into text, and–for shared notebooks–visual cues to show what new content has been added since you last opened the document. I was particularly impressed by One­Note’s ability to record audio while you’re taking notes–and then to let you use the notes to play back the audio it captured as you were writing them. On the other hand, I found the program’s new layers of note organization confusing: You can now create tabs and sections on three of the application window’s four sides, but their hierarchy isn’t immediately obvious. It comes as no great surprise that Microsoft’s initial foray into Web-based Office applications has produced skeletal shadows of the company’s desktop offerings. Even if you have great bandwidth, the best apps available on the Web can’t really match the rich functionality and speed of Office’s robust and mature desktop programs. What Microsoft is doing with Office Web Apps appears to be little more than an effort to fend off Google Docs and other online-apps competitors by giving users who collaborate on documents–or individuals who need access to their files from several Office-equipped computers–a basic alternative. Supporting evidence for this theory: Office Web Apps can edit documents only in the XML-based file formats introduced in Office 2007 (if you try to edit a document made in an earlier format, you get a prompt to create an XML-based copy). And all of the Web-based applications have handy buttons that allow you to open the document at hand in the corresponding desktop program, in case you find yourself bumping up against the online versions’ limits. Most glaringly absent in the Web versions, however, is support for any of the desktop applications’ revision modes. In my hands-on tests of the Web apps, I wasn’t able to open documents with revision-mode changes for editing; I could only view them. You also don’t get any support for video. You can, at least, create new Word, Excel, PowerPoint, and OneNote documents online, via the Office menu item that appears on your Windows Live home page when the apps launch (Microsoft says that this function will be available in June, when the desktop suite goes on sale). And saving items to SkyDrive, the repository for Office documents in Windows Live, is a straightforward, one-click affair in the Backstage view of the 2010 apps. Microsoft is also integrating Web-app support into the new version of Hotmail: Users who receive attachments in Office XML formats will be able to open and edit them in the browser (saving the download step previously required to open the documents in a desktop program). Of course, you’ll still have the desktop option if you want more functionality. Aside from online access, the other principal benefit of Microsoft’s Web apps is that they don’t break Office formatting. Whatever changes you make to a file on the Web, you are unlikely to be surprised with the results when you bring the file back to your desktop. Given the formatting issues that frequently arise with Office docs in competing Web apps, this is no small achievement. The big news in Office 2010 pricing is not only that prices are down in general but also that you can get a significant discount if you forgo buying a physical disc, instead downloading the software, acquiring a trial version on a new PC, or installing it from a previously purchased CD. In any of those scenarios, you’ll be able to purchase a card with a product key that you’ll use to activate the software. The version lineup is pared down, with only three editions to choose from at retail (versus five available for Office 2007), and the price declines are significant. 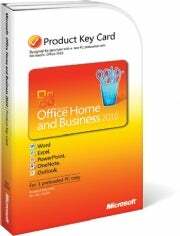 For example, the $199 Home and Business edition (Product Key Card price) includes the same four apps as the $399 Standard edition of Office 2007 does–and adds OneNote. But if you spent a fortune on Office 2007 and were hoping for a break on the new version, forget it: Microsoft is not offering upgrade discounts this time around. Whether you purchase one of the desktop Office 2010 editions or not, you’ll be able to use Office Web Apps free of charge–but you’ll need a Windows Live account either way. 1. PowerPoint Broadcast: Show presentations remotely to anyone with a Silverlight-enabled Web browser. 2. Live Preview for paste: Saves clicks by letting you see what different paste options look like before you commit. 3. User-created Ribbon tabs: You can assemble your most frequently used commands in one place. 4. Lowest Office prices ever: Product Key Card discounts bring some bundle prices to half of 2007 levels. 5. Neat multimedia tricks: In many cases users will be able to embed images and videos the way they want them, without leaving the Office program. 1. Office Web Apps: They’re disappointingly anemic–skimpy in features, and lacking support for revision mode. Though the Microsoft offerings are free, anyone who is looking for no-cost Web-based productivity tools can do much better with Google or Zoho apps, which aren’t limited to editing Office’s XML file formats. 2. OneNote everywhere: Microsoft’s note-taking program is in all versions of the suite, and almost all apps can send material to it at the click of a button. But its new level of organizing options can be confusing, and it isn’t always the most intuitive collaboration tool. 4. No speaker notes in PowerPoint Broadcast: A minor disappointment in an otherwise cool new feature. 5. No 2007 upgrade pricing: I realize that the new editions aren’t expensive, but the people who invested in Office 2007 really should get a break. In addition to improving the core programs of Office (Word, Excel, PowerPoint, Outlook, and OneNote), Microsoft is continuing to bring the look and feel of the 2007 overhaul to Office family members that appear in corporate or volume-license bundles (InfoPath, Access, and Publisher) or are sold as stand-alone apps (Project, Visio). These revamped applications are slated to hit shelves at the same time as the rest of the Office 2010 suite. All of them now have ribbon interfaces with Backstage view. Publisher benefits most from the suitewide improvements to formatting tools. New alignment technology makes it easier than ever to position design elements precisely, and a Hide Scratch feature lets you see how items that bleed off the edges of pages will look when the page is trimmed. Publisher users will also appreciate the addition of Live Preview capabilities to the application. Access users, meanwhile, get an extensible Backstage view that permits IT types to incorporate their workflow into the program. A new Add Application Parts feature has the potential to simplify database creation by allowing you to reuse custom components (yours or a colleague’s) across the suite. Similarly, the program’s new Quick Start feature allows you to add fields or groups of fields to your database easily. Navigation Form, meanwhile, provides simple-to-use tools for creating a layout from your elements; improved conditional formatting and the addition of data bars also help to give your databases visual panache. The 2010 versions of Project (Standard and Professional) provide enhanced visual features–for example, a Timeline view–to assist in creating schedules, assigning resources, and identifying potential problems. The Professional version adds team-oriented features such as the ability to incorporate SharePoint Foundation 2010 task lists and to publish project plans back to SharePoint Foundation. Improved drawing tools available in the 2010 edition of Visio (for instance, the new AutoConnect and the QuickShapes floating minitoolbar) should make creating business diagrams effortless. Auto-alignment technology will help you arrange elements the way you like them, too. Finally, for Windows Phone users, Microsoft is also launching a 2010 version of Office Mobile, consisting of Word, Excel, PowerPoint, Outlook, OneNote, and even a new SharePoint Mobile app to facilitate syncing and collaboration on the go.